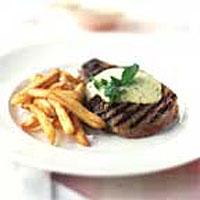 What could be better than a perfectly cooked steak with creamy Béarnaise sauce? Wonderful served with freshly cooked, hot, golden chips. Begin by making the Béarnaise sauce. In a saucepan, place the shallot, half the tarragon, the vinegar and 3 tablespoons of cold water. Simmer gently until the liquid has reduced by half. Place the egg yolks in a liquidiser and add the shallot mixture. Blend until smooth. In a saucepan, melt the butter until it is bubbling. With the liquidiser on, carefully pour in the hot butter a little at a time to form a thick, yellow sauce. Taste and adjust seasoning. Add a squeeze of lemon juice and stir in the remaining tarragon. Pour into a warm sauce jug. Preheat a griddle pan or frying pan until it gets very hot. Brush both sides of each steak with a little olive oil, and season. Fry the steaks until cooked to your liking. Serve immediately with spoonfuls of the Béarnaise sauce, garnished with watercress. If you don't have a liquidiser, make the sauce to the end of step 1. Place the beaten yolks and shallots in a glass bowl over a saucepan of simmering water. gradually whisk in small pieces of cold butter, allowing each piece to melt completely before adding the next one, until you have a thick sauce. Curdled Béarnaise sauce can be rescued by gradually beating in 1 tablespoon of cold water to the hot sauce. Do not reheat once cooled.